Under-the-garage bonus space results in a mini beach house in Town and Country. 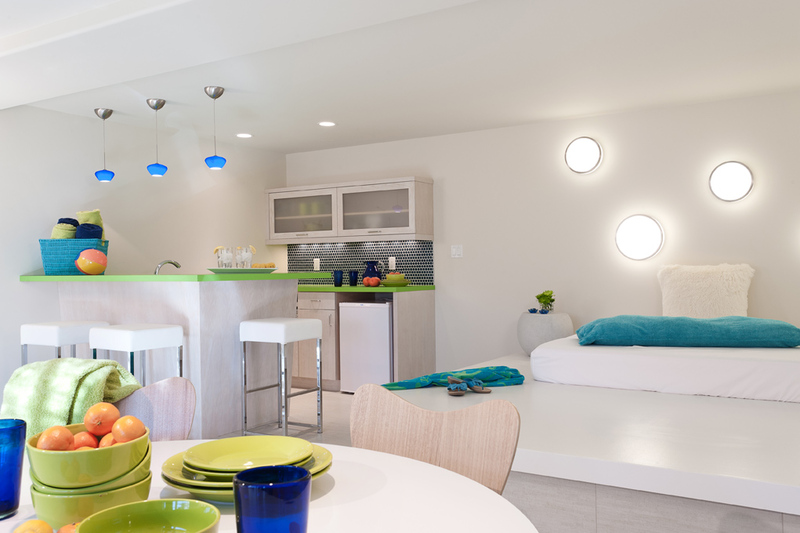 With its clean white walls, sleek furnishings and bright punches of cobalt, lime and turquoise, this lower level pool room is more Miami than Missouri but it makes an ideal mini beach house for the Town and Country homeowners. Located under one of the home’s three-car garages in the featured suburban home on page 34, this bonus pool room is a summer hot spot. A large open area with access to the backyard, the pool room features a kitchen with built-in whitewashed cabinetry, by Centorbi Custom Cabinetry, to enhance the beachy feel the homeowners desired while keeping the space contemporary. Working with interior designer Krista Howard, they were able to achieve the modern, fun summer look they desired. Frosted glass inserts in the upper cabinets keep them feeling light and contemporary. Bright lime green countertops add just enough of a pop of color against the white cabinets, while a cobalt blue backsplash creates depth. Overhead, cobalt blue track lighting illuminates the workspace. With a refrigerator, microwave and sink, the space is fully equipped for entertaining. A glossy white platform can be utilized for additional seating when inside to grab a drink or snack, but also is a place to plop children for an afternoon nap. “The platform bed allows napping kids to sleep while everyone else can still enjoy the outdoors,” says the homeowner. Circular lights decorate the wall behind the bed, while the wall behind the round white table features a blue abstract painting done by Sophia Dalpiaz-Brown of Out of the Box Studio. A shower/changing area off the main room includes built-in cubbies and hangers for clothes or wet towels. The pool room makes a day in the sun easy and fun since the wetness and mess can be contained to one room in the home. With summer just in the horizon, this modern mini beach house will be one of the most used spaces in this young family’s home. Especially with the hot summers St. Louis is known for.